Or as Wikipedia suggested, Man Mansions, Man Spaces, Manctuaries… OK, on second thoughts, perhaps it’s best we stick with ‘man caves’! This type of space has become increasingly common during the last decade and it really isn’t difficult to see why. A space that’s all yours to escape, indulge in hobbies or simply watch the football… or ballet – we’re not here to be sexist! We’re simply saying, have you ever thought to yourself: “Man cave? Who would want one of them?” Exactly – we haven’t either! It’s a silly question, every man on the planet would like his own man cave! We’re a little bit biased, but that’s only because we’ve spent decades creating the best man caves that are the envy of all other man caves; a truly amazing space that’s modern, clever and customisable. And we’re proud to say we’ve built them in gardens across the country! Our man caves come in a wide range different styles and sizes, from the Temple Folly to the Key Studio… all dependant on taste. Introducing the undisputed Ultra range. Our Ultra range is now used in 100s of gardens across the UK for all manner of reasons; however, when it came to setting up shop in our showroom, there was only one way we wanted to decorate the Ultra… and that was a shrine to the possibilities it delivers to be the most enviable man cave in town. So why is the Ultra the perfect man cave? Before you’ve even had a chance to make your mark with the internal styling, you’ve made an impact with the exterior. Floating red cedar walls allow for truly breath-taking design, encapsulated in thick, dramatic black framing. The Ultra certainly isn’t shy with its styling and you can be even more bold, by adding in floor-to-ceiling windows, bi-fold doors, or even an extended roof line. Step inside and the endless design options continue. From hardwood flooring or carpet, classic interiors or our brand new ‘New England’ panelling, you can continue to make a statement with your internal style choices. Once you’ve made these all important decisions, all that’s left to do is to make the space all yours. We can also help with fitted bookshelves or bespoke work spaces. Once you’ve stepped inside, it’s going to be a job to get you back out again! The SMART Ultra truly wins when it comes to offering the most impressive, modern and best man caves there are on the market today – and what’s more is you don’t have to wait weeks for the build. They are constructed in as little as 1-2 days so you won’t have to put up with a building site to get your hands on this man cave. Two or three SMART craftsmen with all hands on deck will work quickly and efficiently to make sure your man cave becomes a reality. Intrigued? 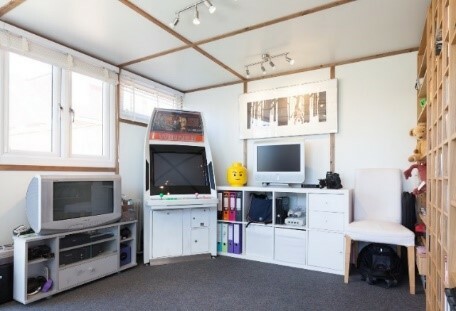 As we mentioned earlier, we’ve created an example of this man cave in our Suffolk showroom. 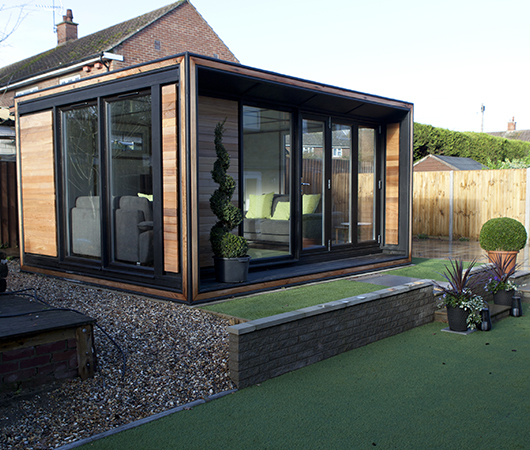 So, call Garden Office Experts today to book your appointment to visit. We’ll be happy to show you what we’ve done with the place, including our five other stunning ranges. Simply give us a call!